Iron deficiency-anemia in babies and young children can cause cognitive or other developmental difficulties or delays. According to MedlinePlus, iron-deficiency anemia is most common in babies 9 to 24 months of age. Liquid infant supplements that contain iron often taste terrible and can stain clothing, making administration a challenge. 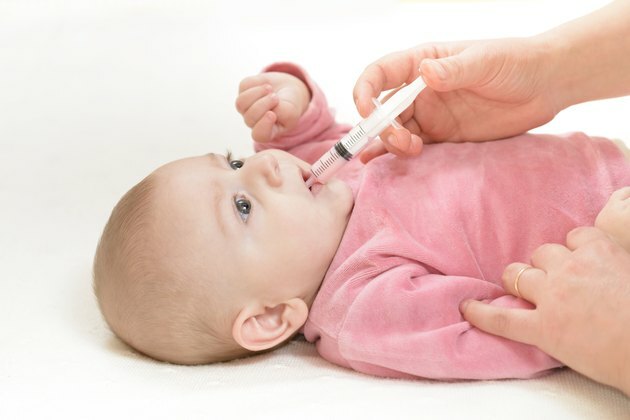 However, with the right technique you can safely and effectively administer a liquid supplement to your infant or child, if recommended by a pediatrician. Iron is a mineral that is toxic when consumed in excess. Therefore, keep all iron-containing products out of the reach of babies and children. Infant vitamin and mineral supplements are often available in liquid form, since babies are usually unable to safely chew or swallow vitamins. However, depending on your baby's diet, you may not need to use iron-containing supplements. You should only give your child Iron-containing pediatric supplements if they are recommended by a pediatrician. Most infant formulas are fortified with iron and, according to the American Dietetic Association, although breast milk is lower in iron, babies usually have enough iron stores in their bodies to last until about 4 to 6 months of age, at which time iron-fortified infant cereals are typically started. MedlinePlus notes that infants absorb the iron in breast milk three times better than iron in formulas. Babies who are born with low iron stores, born prematurely or who have problems absorbing iron may have an increased risk for iron-deficiency anemia without supplementation. Children who are vegans or vegetarians may also have an increased risk for iron-deficiency anemia. As directed on the bottle, shake the liquid iron supplement well before administration. This is to help ensure that the iron in the liquid is well dispersed so your child receives the proper amount of iron. Avoid giving your child a liquid iron supplement on an empty stomach. Although iron from supplements is usually best absorbed on an empty stomach, giving your child an iron supplement on an empty stomach can cause stomach upset. Administration of a liquid iron supplement can be fairly messy. Due to the bad taste of most liquid iron supplements, many babies and young children try to spit out the supplement. To avoid clothing stains and spills, remove your child's clothes before administering. Insert the dropper inside your child's mouth and point it to the side of her mouth. Administer in small doses. Because liquid iron supplements usually taste bad and can leave a bad aftertaste in your infant's mouth, follow the iron supplement with something that tastes good to your baby, such as breast milk or infant formula, or mix the supplement with something sweet. You should switch to a chewable iron-containing supplement when your child is ready, as directed by your pediatrician.